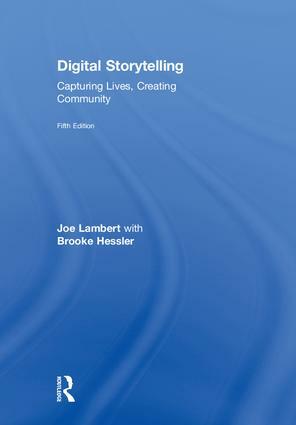 In this revised and updated edition of the StoryCenter's popular guide to digital storytelling, StoryCenter founder Joe Lambert offers budding storytellers the skills and tools they need to craft compelling digital stories. Using a "Seven Steps" approach, Lambert helps storytellers identify the fundamentals of dynamic digital storytelling – from conceiving a story, to seeing, assembling, and sharing it. Readers will also find new explorations of the global applications of digital storytelling in education and other fields, as well as additional information about copyright, ethics, and distribution. The book is filled with resources about past and present projects on the grassroots and institutional level, including new chapters specifically for students and a discussion of the latest tools and projects in mobile device-based media. This accessible guide’s meaningful examples and inviting tone makes this an essential for any student learning the steps toward digital storytelling. "Digital Storytelling is not your typical text for writing courses—it is a truly engaging history about storytelling that helps students connect to why we even tell stories. Storytelling is an art, and Lambert’s text reflects this. I enjoy using Digital Storytelling to not only teach my students how to become comfortable with telling stories, but to also inspire me on how I approach my storytelling instruction. The text covers the essential elements of storytelling via a storytelling circle that creates a safe environment for the most timid of students to participate in class. There are also plenty of astute examples and references for the students. For a book that averages about 200 pages, this is quite a feat. My students tell me this is a text they enjoy reading and applying the techniques the text offers them in order to help them craft stories with a enhanced sense of creativity and a can-do spirit. This is one of a small collection of texts that students typically do not sell back, instead they share and re-read their text when they need to rejuvenate future stories—some of which have gone on to win awards or shaped capstone texts and films at UHCL. This text is a must for any storytelling course. Your students will thank you for making this their primary text for your course. This new edition updates some of the content to ensure the text remains contextually relevant to the field of storytelling and its related topics in the dynamic academic landscape of digital media communication. Joe Lambert founded the Center for Digital Storytelling (now StoryCenter) in 1994. He and his colleagues developed a computer training and arts program known as the digital storytelling workshop. Joe and his staff have traveled the world to spread the practice of digital storytelling, to all 50 U.S. states and some 48 countries. Lambert is author of Seven Stages: Story and the Human Experience (Digital Diner Press). In 2017, he celebrated his 34th year as an Executive Director of StoryCentre, having evolved his work in the 1980s in the performing arts to work in digital storytelling and media education in the 1990s. Brooke Hessler is Director of Learning Resources at California College of the Arts, where she teaches multimodal inquiry and writing. Her scholarship has appeared in the International Journal of the Scholarship of Teaching and Learning, Community Literacy Journal, Writing Groups Inside and Outside the Classroom, A Guide to Composition Pedagogies, and Digital Storytelling in Higher Education: International Perspectives, among other journals and collections. An award-winning instructor of media arts-integrated courses, her digital story work has included long-term collaborations with K-16 educators, community arts activists, museums, and survivors of natural disasters and domestic terrorism.